When the defrost button is pressed the outside (fresh) air position will automatically selected and the air will be discharged through the windshield defrost vents. The air conditioning will automatically operate based on ambient temperature. 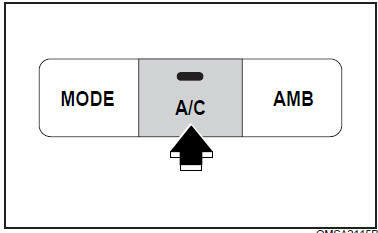 If you don’t want the air-conditioning or outside (fresh) air position press the corresponding button to cancel the operation. Push the A/C button to turn the air conditioning system on. The indicator light in the button will illuminate when the fan speed control knob is on. Push the button again to turn the air conditioning system off.